New Delhi: Diwali, the festival of Lights, is celebrated across India with the greatest pomp and fervour. Some like to keep their celebrations loud, some like it bright, while others like it quiet and cosy. While Diwali is all about partaking in revelry with friends and family, it’s also a good time to travel and escape the noise and pollution of your big city. With a long list of holidays on your side, it is rather easy to leave the urban chaos behind and bask in nature with loved ones. Pristine beaches, azure waters and cotton candy clouds, a perfect invitation to spend the Diwali holidays in peace. Spend your days waking up to the warmth of sunlight caressing your face, take a cool dip in the sea, laze on the beach, take short treks across the hillocks and in short, have the time of your life! The Om Beach, which is so called as the waves create a pattern of their own in the form of the mystical “OM “symbol, is one of the most popular spots to relax all day. Activities include trekking, canoeing and boat rides. Chalk out your own itinerary, or lose yourself in a spiritual wave, or party hard at the other beaches here – chances are that you will not miss the fireworks. This hill station is nestled in the Nilgiris and is surrounded by tea plantations and lush greenery, making it the perfect Diwali getaway. Nothing can be more exciting than taking a journey up the Blue Mountains. How about a ride down the hills on the Nilgiri Mountain Railway? As the train huffs and puffs along on its own little pace, you can soak in the fresh air and the mist. Get off at any station and explore the surrounding environs. Keep your eyes peeled though, for Coonoor has a large variety of bird species hiding away in the trees. 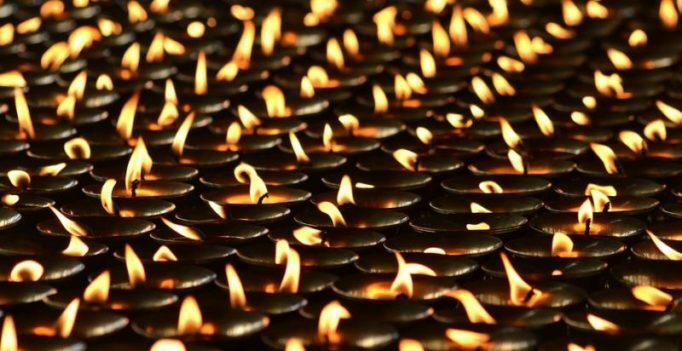 Diwali is not celebrated with sound but with light – as it is meant to be done – in Thailand. Called Lam Kriyongh, it’s celebrated with the lighting of lamps made from banana leaves. These lamps hold candles, a coin and incense, which are set afloat in the closest river. More peaceful than loud and extravagant, Lam Kriyongh is a great way to experience a different Diwali! Located at a distance of 180 km from the Kolkata airport, Mandarmani is a charming village resort by the sea. The beach offers many activities such as early morning walks, the chance to observe the mesmerising sunrises and the sight of red crabs scurrying about etc. You can also enjoy driving your vehicle on the beach! The many resorts here provide a peaceful and relaxing stay far from the raucous of Diwali. The interior parts of Kerala and the backwater regions are a great pick to escape the Diwali madness. Backwaters such as Kollam offer peaceful holiday options. As celebrations are on a very low scale, you can enjoy the picturesque beauty of the location. Pick from varied stay options such as a houseboat or a floating cottage or a luxurious resort and spend your time languorously enjoying the grandeur of nature. You can also enjoy the delicious Kerala cuisine and Ayurvedic spa options, both are bound to leave you feeling extremely pampered.